Arrived in Pissos shortly after 5.00 this afternoon. I am booked into a Chambre d'Hote, run by a very nice couple, the lady of the house gave me a bottle of beer as I arrived. 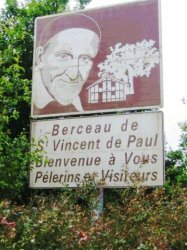 It was very welcome, the last bit of the journey was tiresome, the house was hard to find, no one in the village had even heard of the chemin which I seeking, a man knew the people and directed me here, but is a wee bit out of the way and there are a maze of small roads around the village. Easy to go up a blind alley. For all of the day I have been on roads, through pine forest mostly. Rather uneventful, I had lunch in a small village at shortly 12.00 noon, I only took a sandwich today and I am now looking forward to an evening meal with my hosts. Breakfast this morning was very interesting, I met a very charming lady walker, Pat Murphy, she is American, living in Canada for circa 30 years, in Nova Scotia. Her husband is at home in Canada, they have a daily telephone call, he is or was a Professor of French Language and Literature. She had been a teacher, has visited NI; when her son did a year at Queen's, studying Anthropology, I smiled at that, he'd have a long way to go back to sort us lot out! She has been walking for 4 weeks and hopes to be in Compostela for the 7th. July, around the same time as myself. She speaks French and is using the French handbook, strangely it differs from the English one, for example the French do not go through Pissos, I think they are further west, but our paths cross at Dax and are probably the same from there to St Jean Pied de Port. We had good conversation this morning, had a few photos taken then I walked on. It is better to walk at your own pace, although I am sorry that I missed my friends a few days ago after coming off the ferry. I hope we do meet again, we have exchanged addresses and I hope Pat and her husband will come and visit in Rostrevor. So that's been my day to date. I had been talking about pulling flax and I think I covered the pulling part. The flax now had to be buried and allowed to rot. The flax pit would be well drained by now, but there would still be water in it, the sheaves near the pit, i.e if the flax was in the same field as the pit, would have been carried over and would be spread around the pit ready to handed to whoever was in the pit building it in, or the horse and cart was to hand, flax built on the cart and hauled to the pit. No matter what way it was it was very labour intensive. There might be two men in the pit building in the flax, alternate heads and butts, this kept the built flax level, work your way down the pit and back up again, a tight mass of flax sheaves. I have had a few lovely days, my sister Anne & husband Carl have been with me, they headed back to Biarritz yesterday at about 3.30. I really enjoyed their company, and I know they had a great time. I will go back a few days because I haven't written anything for several days, I'm not even sure of where I did get with my journal! 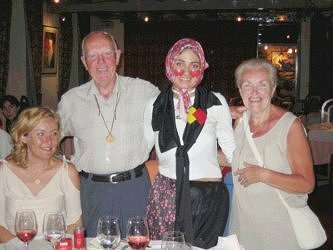 I think it was my experience with Andre & Josiane Courdent in Pissos, and my subsequent journey to Belin where I stayed in another Chambre D'Hote with the Clements family, and met a very charming Canadian (American living in Canada for years) lady called Pat Murphy, but I think I've covered that. I'll start with my journey to Sabres where I stayed in the Auberge des Pins, a delightful place, I arrived in time for lunch, I had a beautiful room which opened out onto the lawn, fine food, great wines, a lovely experience. I was well rested in the morning and headed for Morcenx, still travelling through pine forests on very minor roads, long, straight, seemingly endless, here and there a clearing where crop were grown - always corn now. You know the kind, corn on the cob, but I think this was being grown for feed for animals, every now and then you would see huge basket type structures into which the corn was placed for storage. Not the pleasantest of walking but very little traffic, the hand book I have advises that there is no alternative but to stick with the road even though it is very dull. At one forest clearing, the timber had been felled some considerable time ago, and nature was again reclaiming its own, I spied at a considerable distance a herd of cattle, I immediately recognised them as the fighting bulls, as I stood to observe them, there was a strong wire fence between them and myself! They all started to rise looking in my direction, I took several photos but probably at too great a distance to see them properly, but even at that distance I was struck by the power which they exuded. As Finn would say, 'You've got to watch them Bulls', so discretion being the better part of valour, I made no attempt to get a closer shot, no running with the bulls for me! I was tired whenever I reached Morcenx; perhaps the journey was not that long but uninteresting. The hotel was closed but I had been given a code for the door by Christine, my ever-faithful booking agent, and I let myself in, got my key and stowed my gear in the room. I had eaten earlier at a Bar up the street, you have to reach these bars before 2.00 or you could go hungry, they close until 5.30. I later went out to eat at around 8.00 and again could only find a bar, the food was mediocre, but filled a hole in my tooth. The following day was Friday, I was travelling to a village called Laluque, again a uninteresting journey, just a hard slog in the now ever present sun, however I received a very warm welcome in the Hostelrie Landaise, from a very nice couple who run it, probably own it. I was the only guest, the man of the house had a little English, whenever I enquired about the evening meal he simply indicated that I could have it at any time, it was up to myself. Fine, I decided to come down at 7.00, a little earlier than usual, arrived into the bar, 'Mange?' - 'Oui, great' 'Will you have a drink while you're waiting' style of thing. I order a glass of red wine, there are two customers in the bar, a youngish fellow sitting up at the bar, drinking what at first I thought was rose wine, but it turned out to be Kir, and an elderly man who finished up his drink and left shortly thereafter. 'Fish? ' 'Do me well', I finish my wine, say I'll have a Kir, 'Non, vin de la pays,' 'Yep I'll try that', he pours a large glass of golden coloured wine out for me. Now I prefer very dry white wines, but this is douce and very pleasant, still no sign of food! I finish the glass of wine, that's two good measures of wine I've now had, I indicate I'll take another glass of vin de la pays, which he pours out. Still no food! Of course I have to respond and the 3rd glass starts to empty, still no sign of food! I had begun to think this was going to be a liquid dinner! I'm going to try to get up to date before Nuala arrives. I think I finished in Laluque. I had my 3rd large glass of wine nearly finished whenever I saw Madam going to the table with a bottle of water and the customary basket of bread; I breathed a sigh of relief. I had noticed a young woman coming in earlier, she had two youngsters with her, both in PJ's, probably about 8 & 4, she went in the back, they sat out on the veranda, with books, colouring in etc., I assume they were grandchildren and she was the chef. All this time the darts players, who were somewhat removed from me in another section of the bar, would raise a glass to Irlande! Much shouting and saluting, I was getting through the wine rightly! At last I was called to the table, I didn't need any coaxing. I ordered a half bottle of Rose, I didn't finish the sweet wine, it was beginning to get too much for me. Both starter and main courses were fish, both delicious. I couldn't tell you what they were but the main course looked like mop herrings, rolled up and skewered, but not marinated and definitely not herrings (I know my herrings), a nice sauce and some form of pasta, which I generally just pick at choosing to eat bread instead. By God I could go a good feed of spuds, but the only spuds I ever see are in the form of frites, or almost as a decoration on the plate. I shouted 'Bon Nuit' to the assembled darts players and made my way upstairs, I think that might be a euphemism, to roars of 'Bon Courage', 'Bon Route', 'Bon Chance'. The following day I would be heading for Dax where I hoped to meet up with Carl & Anne, not a very long journey, I could leave shortly after 8, for that was the time I had arranged for "mon petite dejuner". 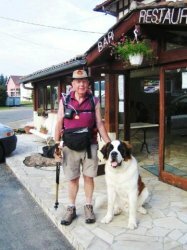 Up the next morning, on the road by 8.30, but not before I had my photo taken with a huge St. Bernard dog, a beautiful animal, the size of a Shetland pony, my hosts had two dogs, the St. Bernard. And a spaniel type mottled black and grey, looked like a gun dog. I had enjoyed my stay, lovely people, friendly customers, no shortage of wine! I headed out for Dax, an uneventful journey until I came to within about 5k from Dax, I then saw a sign for St. Vincent de Paul, and an indication that it was the Saint's birthplace, about 2km plus off my route, another 4k was not going to kill me, and I just could not pass without calling to visit where this most Christian man had been born. I had been a member of the Newry Conference, St. Josephs, in the very late 50s & early 60s, and I have the highest regard for the work which they do. The men, women & youth of the Society of St. Vincent de Paul richly deserve our support. A little aside, at one stage during my time in the Newry Conference, a three day youth conference had been called in Dublin. I was married, living in Cloughogue with two children, but Alice said go ahead. So myself and another young man set out for Dublin, in his car. I was bowled over by this conference, the organisation, the topics for discussion, the numbers attending, the enthusiasm of the delegates. The venue, the Shelbourne no less! After the introductory speeches and talks we were split into discussion groups of about 8-10 people, you discussed a topic for around and hour, whoever within the group had been appointed (by the group itself), as chair then gave a synopsis of the discussion and conclusions if any, as you can imagine this also took some time, a break then for tea etc. And back with another group for another set of topics. This meant that you met and mixed with numerous people. The situations North and South were different, we had a much better Social Service than our Southern counterparts, and of course that meant different problems. But it meant that you really had to think of where we were at as a St. Vincent de Paul society. Two full days of discussions probably, introductory on the first day and a summation on the final day. Anyway I spent my evenings writing up all about the various discussions and what was being proposed, I finished up with perhaps 4 foolscap pages about the conference and various proposals for our own Conference at home. On the way home then I read to my companion what I had written and suggested that we present it to the next meeting of the St. Josephs Conference, he agreed. I came home, got a typewriter from H&P, together with Gestetner paper and proceeded to type up my report, no photocopying then! You made your stencil and ran it off on the Gestetner, so into work and run it off, staple about 30 copies ready for the meeting. I put both our names on the document, since we both had attended the conference. It was distributed that evening, people were asked to read it during the week, and it would be discussed the following week. All who had taken the trouble to read it were enthusiastic about its content, and then came the back slapping. One gentleman got up and talked about the wonderful job that had been done and proposed a vote of thanks to my colleague, who had accompanied me to Dublin, for producing such an informative and thought provoking document. I never said a word and neither did my colleague; he sat there smiling accepting all the accolades. I had not written it for accolades and it was having the desired affect so I held my council, but it still grates. At the end of the meeting I was approached by two individuals, they were not together, at two separate times, who with a wink said 'I know who done the work'. Enough said. Another incident from those times I think worth recording. One of the member's, actually two, because you visit in pairs, reported that they were visiting a home, where drink was the problem. A husband, who was out of work, was drinking "the bru" leaving a wife and young family in a very destitute state. But worse he was physically abusing the poor wife. Apparently it was obvious from bruising etc. But she had never complained, although neighbours had reported it. Father Lynch, God be good to him, was the Spiritual Director of the Conference, he never said anything at the meeting but I heard that he visited this home, whenever he was sure the man of the house would be at home, whipped off his coat and his collar and invited the man to try and take him on! I am not sure what the outcome was but could that be described as practical Christianity? Before I leave the St Vincent de Paul Newry Conference, I should say that I think the document which I produced after the Dublin experience, was the spur, the impetus needed, to reconfigure the Newry Conference. It was much too big, trying to cover too much ground, new Conferences were needed in Dromalane and the Meadow. Dromalane was in a different Parish as well, though everyone thought of them selves as being in Newry, I don't know whether that is still the attitude today or not. Dromalane and Barcroft are part of Cloughogue Parish. A new Conference was formed in Dromalane, and shortly after another was formed in the Meadow, I think Derrybeg was built or was in the process of being so. In addition a Youth Conference was formed, Donal Quinn and I were to look after and guide it. Willie, Alice's brother was the first President, Paddy would later follow him, and in between we had the mighty Louis Boyle. Such craic! H&P had bought a house, beside the yard in Kilmorey Street, it was to be the first home of the Youth Conference. We gathered second hand clothes, you can imagine the dressing up of some of them young fellows, there were all sorts of clothes, including some women's underwear, Kiernie McAteer used to have everyone in stitches. Then they ran Children's Christmas parties and parties for pensioners. For the children they gathered up old toys, always good but used, they parcelled them up Blue Paper for boys, and pink for the girls, and also an indication of age group, we then had a party up in the Bosco, at which Father Christmas distributed the toys. Gertie, Alice's mother, Alice and Anita and several other mothers used to come on the day to help out, distributing minerals and the like, tea and buns for the attending mothers. Now they worked hard; Alice and the others I mean. After one of these parties, on our way home, Peter could tell me that Santa wore exactly the same boots as I did myself. I had even more respect for Santa after that, he obviously has excellent taste! The hardest thing that Donal and I had to do was to curb the enthusiasm of these young people, without appearing to be fuddy duddies, and without killing that enthusiasm. To demonstrate what these young people were about, I'll relate a little anecdote. Paddy and I think Tommy used to visit, among others, an elderly lady living off Canal Street, Sinclair Street. I think. Gertie, Paddy's Mammy, a great cook, used to bake an apple tart that they took to this old lady every week; whenever they called she would return the plate from the previous week's tart. Eventually she admitted to the boys that she retained the plate to ensure that they would return for it on the following week! There's someone who looked forward to a visit! 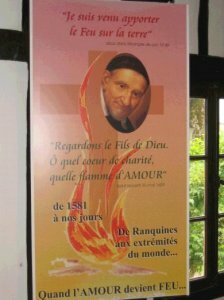 I was delighted to visit the home of St. Vincent de Paul, and remember those happy days again. 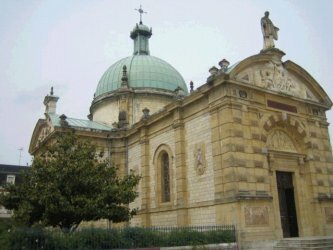 And I did as I sat in the sun outside a small exhibition area showing the Vincentian's work world wide, drinking coffee prepared for me by a beautiful youngish Sister of St. Vincent de Paul, Sister Elise. She also gave me a bag containing a huge baguette, with a soft cheese filling, an apple and a very large tomato, and a piece of tart. She then closed her small office, but not before I managed to get a photograph of her and she took one of me sitting under the tree. I took my time and returned to the road. I think I could have gone on through the village, but I was unsure and returned to my original route. Within a very short distance of Dax, I again stopped and leisurely eat the tomato; it probably was around 3.30. I dandered on, the sun blazed down so I wasn't going to hurry. I was just into the town proper, business premises, heavy traffic; I was at a pedestrian crossing, getting rather impatient with a car which did not move whenever I indicated with my stick that they had the right of way. Traffic at a standstill, the car door opens and here is our Anne, arms open wide, a smile that would warm anybody's heart and round she comes and hugs me. We can't believe it, is St. James at his work again? She had missed my last email and thought we were not meeting until 2 days later. They were in Biarritz and had booked in for 2 more nights. Carl meantime had driven round the corner and I got just as warm a welcome from him whenever he managed to get out of the car. No more walking for me that day! I stowed my rucksack into the car and went off to find a route to our hotel, I say "our", because Christine has booked myself and Anne & Carl into Le Richelieu, a hotel on Victor Hugo Avenue. A man is stopped in his car at traffic lights, I ask for the hotel and Victor Hugo. Avenue, 'A pied? ', 'Non, en voiture'. He indicates that he will pull across and turn in right, we are to follow, Carl gets the car turned and we follow after this man. Now this takes a bit of time but there he is, arm out through the window. We follow him through what seems a maze of streets, arm out through the window again pointing and waving frantically, he speeds on. Carl gets stopped, we realise we are just at the hotel. We all book in, and return to Biarritz to check out and cancel the room for the next few days. The girl at reception in Biarritz is very friendly, that night will have to be charged but the following days are cancelled. Carl & Anne walk me down as far as the beach area, it's magnificent, sun is shining, big, big breakers, fantastic shaped rocks jutting out of a white foam, with azure blue water beyond, golden sands stretching away as far as you can see, loads of people about, carefree happy atmosphere. We drag ourselves away for the journey back to Dax. Anne & Carl had no idea I would be in Dax, they were just after getting the car and thought they would have a look at Dax. Thank you St. Seamus or who ever is looking after us, but I have been told there are no coincidences, extraordinary things happen on the Camino, this is just another instance. We decide to eat in the Hotel; we are booked in for two nights, no walking on the morrow. We had a lovely meal together, aperitifs, the very best of wine, loads of chat; I think I talked that much, that I eat very little. During the meal a party of girls arrived, I'd say about 10 in number. With them, a beautiful young lassie, wearing outrageous heart shaped sun glasses, perched on the end of her nose. Subsequently she circulated around the tables with a notebook in hand. She approached our table, enquired what we thought about "lurvve", or l'amour. Of course we were happy to tell her, but language is still the problem, but I think we got our message across. It transpired that this was her Hen Party; she is to be married in 2 weeks. I need no further encouragement; I will sing at least one verse and a chorus of Ben's song 'Wedding Daze'. But before I do, I ask a waiter who has quite good English will he translate for me. So I write out the words, accrediting them to you Ben, go over it with my translator, who then passes it on to the Bride to Be. The only thing she may have understood were the lines 'and send you wee childer to keep your hearts warm', because at that she lets out a big 'Wooo'. So I sing it for her and get warmly kissed on both cheeks, sure that's the only reason I sing these songs, it's all these hugs and kisses that keep me going! We take several photographs and exchange addresses, I'll send her through the photographs, but perhaps I should do it quickly, vows and promises don't seem to matter much nowadays. A great night, I'm thrilled that Carl & Anne are with me. The three of us go to mass the following morning, we are in early, the Cantor is rehearsing the congregation, Mass starts and seems to go for an eternity, the priest preaches, why he has to go on so long I'll never know, he is preaching to the converted, why bore the life out of them? I think of Father Barry and Gus, they reckoned if you couldn't say what had to be said in two minutes, you shouldn't start. A short sharp knock is what's needed. I remember a story told by Dommie McGivern demonstrating Father Barry's astuteness. A Miss McConville, a lady apparently with no family, big house on Needham Street, later Patrick Street, had died and the story is; left all to the Dominicans. After the funeral there is a bit of a reception for the mourners, one very nosey individual could restrain himself no longer; he approaches Father Barry, the Prior, 'Did she leave much Father'? 'Why', says Fr. Barry, spreading his hands out in that open expression, 'she left everything!' And promptly moved on. Mass does us no good, but we did receive the Blessed Sacrament. 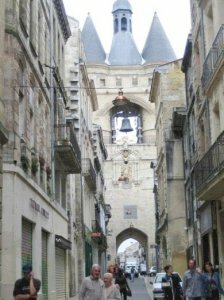 I have already seen Bordeaux, a flying couple of days; Anne & Carl would like to have a look, so there's where we head: the roads are good but it is still at least an hour and a half's journey. The day is a lot cooler than previous days, several degrees cooler in fact and rain threatens, but comes to nothing. I enjoy showing off my knowledge of the City, two days & I know it all! We return to Dax, a nice day, not yet over, we will dine together again this evening. Our hotel dining room is closed, most of Dax seems to be closed, but the hotel directs us to a small restaurant quite close. We walk, dine and return to our hotel, but Carl has this habit of keeping me out of bed by ordering late drinks, it's a wonder Anne wouldn't say something to him! 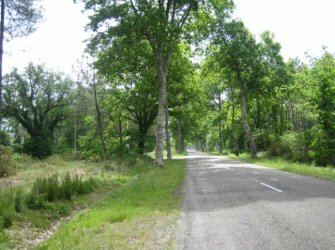 We are walking on the morrow, we are already on Victor Hugo Avenue, and it's a straight road for our destination Peyrehorade, Le Central Hotel. It's strange but I haven't much recollection of Peyrehorade, I am simply thrilled to have Carl and Anne's company. The gear is put into the car, no rucksack to carry, Carl & I will walk together first. Carl & Anne will leap frog, Anne drives, parks, walks back to meet us, we walk to the car, and Carl then drives and does the same until our destination is reached. A great arrangement, we make good time. Anne is a great walker, she walks most days when at home, and she sets a fairly brisk pace. We have a break in the middle of the day. We have caught up with Pat Murphy, my Canadian friend, and we dine together, Plat de Jour, no choice, water, bread, and a carafe of wine are put down before us. We are then served soup, a clear perhaps onion based soup, full of little clear balls, there is a large tureen and we help ourselves. We are then served chicken and I think frites with a nice sauce, followed by a dessert. Carl picks up the tab, 40 euros the lot, and she has replenished the wine! We take 2 hours over our meal. Pat is heading in a different direction, towards some monastery where she will spend the night in a dormitory. I offer her my sleeping bag, since she doesn't carry one because of the weight, we will meet in St. Jean Pied de Port in a few days, but she insists she will manage. I remember Bert Slader's story about his two companions that he took on the Camino. They were staying in Refugio's, in open dormitories, Bert being a seasoned traveller and now on his 11th Camino, well known to Refugio staff was being given preferential treatment, a room and a bed to himself, while his companions roughed it. During the night, one of his companions was having a restless night, the sleeping bag within arms length opens, and out steps this Germanic blonde, not a stitch on, (Phyllis he got a full frontal, no bottle needed there), she proceeds to don a rather short shirt and heads off to the toilet, his restless night continued! Perhaps I might try these Refugio's; you never know your luck. I remember the following evening very well, Carl , Anne & I follow the same procedure the following day as we head for St. Palais, gear in the car, Carl & Anne alternating at the driving. We arrive in St. Palais, Carl was ahead of us in the car, the hotel is closed, but workmen are doing something to an awning at the front. He has been to the hotel and has been told it is closed. I go over anyhow, in through the door, a young man working outside follows me in, 'Reservation, O'Callaghan'. That has the desired affect, a young and very charming lady appears, 'Brian', I say stretching out my hand, 'Marilou �'. Wow, could have been my Marilou a number of years ago, will I ever forget her? I call Carl & Anne up the stairs, 'Who's the single', 'Moi', she lets me into the room. A beautiful room, big, bright, a couple of chairs and a desk, en suite, BUT nothing compared to Carl & Anne's room. A small ante room with a sofa, double doors opening off this ante chamber on to a balcony, filled with flowers, and a gorgeous jasmine tree facing the doors, there are two workmen, gardeners, just finishing some planting. The elder of the two, a very agreeable man, is Dutch, went to school in England and he has a good chat with C & A. The bedroom itself and the ensuite are large and very tastefully furnished. Although closed, the dining room will be opened for us that evening. We meet just before 8.00 for dinner; Anne has fallen in love I think with Kir Royal, peche liqueur and champagne, Carl and I being mere mortals, have ordinary Kir. Marilou presents us with the menu. We are all having fish, Anne & I order lobster, Carl has a fish dish of something else and I also have a starter. We choose a Sancerre wine. Anne says she'll stick to Kir Royal! The meal is magnificent, the young man who followed me in to the hotel earlier is the waiter and several other people have been accommodated. Anne decides to have an early night, and Carl leads me astray again. We order Grand Marnier, and then a second, saying we'll have it in the bar, to allow the tables to be cleared. We weren't too long in the bar until a young man, perhaps a few years senior to our waiter came in, and he had on the whites of a chef. 'Chef?" 'Non dish washer', we said well, it was a lovely meal and even a dishwasher was entitled to a drink after such a meal, he'd have a bottle of beer. The restaurant had cleared by this time and our waiter came in, 'Drink' yep, another beer. We were having a good look round the shelves by this time. Carl spied a rum, at least I think it was a rum, liqueur, we'd try that, two rums later and a few beers for our companions. 'Would we like to try a drink de Pays?' A green liquid, sure what else could we do, our National colour, we'd try that. Tasted good. In the meantime Marilou had joined us, brothers and sister, non, non, Mamma and sons! The elder had a partner and a child of 6. My God, this slip of a lassie looked far too young to be a granny, why was I born so young and so long ago! But sure I wouldn't have changed anything about Alice anyway, such is life. Marilou was drinking a form of champagne, a fine female lady's drink, she then put up another of those green concoctions for us and at that we called a halt. We told Anne we went to bed around 11.00. Perhaps a little white lie! The following morning breakfast was on the 1st floor, a great spread, juices, fruit cocktail, cereals, coffee, teas, lashings of fresh bread and croissants, preserves the lot. A wonderful place to stay, good company, great food, brilliant staff, and with a name like Marilou, how could they go wrong! You know I am getting confused! The foregoing all happened in The Central Hotel in Peyrehorade. Having checked into The Central Hotel in Peyrehorade, I decided I would walk a little of the next days journey, in an effort to shorten the following day, I had set out before 5 and asked Carl to come out for me at 6.00. Would cover perhaps 6km, and make the following day a shorter one, it was to be Carl and Anne's last day with me. They would return to Biarritz some time in the evening, have a relaxing day the following day and then fly back to Dublin. I probably did cover circa 5-6km, and after that hearty breakfast we got a reluctant Marilou to come outside for a photo, we all headed off in the car to my stopping place of the night before. Meanwhile Anne has gone ahead to suss out the next village to sort out the eats, Arrute Charitte. No charity there but, no where to eat! It will be nearly 2.00 by the time I get there, Carl and Anne then head off together to try to find a Boucherie and somewhere to buy a bottle of Rose Wine and some water. I reach the village shortly after 1.30; they have the wine but no bread, no cheese. No 'Supermarket Wine' here and we decide to drive into St. Palais to eat, before they shut for the siesta. While in St. Palais I find my Hotel for the night, take my gear out of the car, and we return to Arraute Charrite, here we must part. Anne hugs me warmly, I have loved this girl all of my life, we have always been very close; I suppose the way our John and Lilly were. There is not a lot of difference in our ages, she was bigger than me when we were growing up, and could more than hold her own in a scrap. I remember her knocking me out of the back of a small lorry me dad used to have in Carrickbracken, a fierce right hand! Tears are not very far away, they're there but I am very moved by both Carl and Anne's support and the obvious love they have for me, I thank them for it and for the joy of those few days. God bless you both. I start walking again, turn and they are watching me, a toot of the horn and they are gone. I am on my own again. I probably still have 9km to go, I have a lovely room in the Hotel, a little balcony overlooking the square, I do my washing, bring it out on to the balcony and hang it on the chairs. There is a youngish couple on the next balcony, it turns out they are Canadians, Mick and Maureen, I enjoy a short chat with them, they would love to talk but time is running out, they do a lot of walking at home. I speak to them the following morning before I leave, would loved to have stayed longer but I have already glimpsed the Pyrenees and the pull of these magnificent mountains takes preference over everything else. I will be walking on a Piste for most of the way to Larceveau and I look forward to that.